I hope your Friday evening ran more smoothly than ours! Hugo’s still having a love/hate relationship with sleep. Yesterday evening we were definitely on the hate side of the equation. We decided to get some take away for dinner and, by the time Alex got home from picking it up, Hugo was back up, playing at my feet. What can I say? I’m just not prepared to listen to him cry. Fussing is one thing, distress is another entirely. Anyway, a bit of a play and a cuddle later and he was back to bed. According to the Wonder Weeks app, Hugo’s hit the consequences leap – meaning that he has come to understand that if he fusses enough, I’m likely to go and pick him up. Yet another ‘this too shall pass’ phase. A funner phase also hit us this last week. Crawling! Our little one is on the move and nothing is safe. I think I’m going to have to sweep and vacuum (a lot) more than I usually do. This morning I’ve found him eating both fabric off cuts and overlocked thread scraps. Whoops. You know those comments about how I get things done? Well, I do it by not doing as many domestic duties as I could. Hmmm. I might have to add the floor onto the ‘must do’ chores list. Boo. Anyway, an upside of my Friday evening was this sweet little pin cushion. I often end up chasing my pin cushion around the house. I do my fabric cutting on our dining table, and my sewing in a little room off our living area. When I’m in the middle of a complex pattern, I often end up walking between the two to retrieve my pin cushion. Two pin cushions solve this (first world) problem. 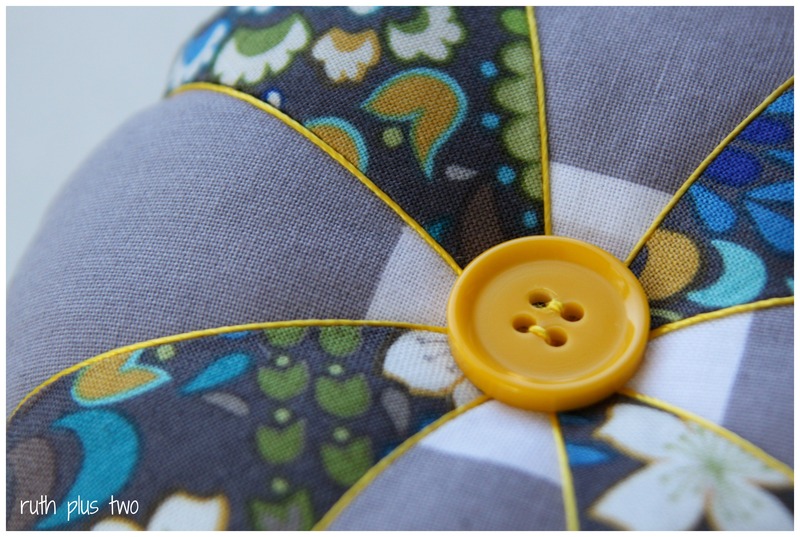 I found this tutorial from Olive & Ollie’s Heather which was featured on the Riley Blake Cutting Corners College site (check it out if you sew – it’s full of fun projects). I am happy to say that this pin cushion is made entirely from things I had in my stash. The fabrics are Riley Blake Design Stripe and Wish by Valori Wells Designs for FreeSpirit. The button is a Beutron button left over from a project I’ve not shared yet, and I’ve been toting the yellow thread around with me since a trip to Brisbane when I was 16. Yep, I have trouble letting go of things which might one day be useful. I don’t have a hoarding problem. No, not at all (no comments, Mum!). 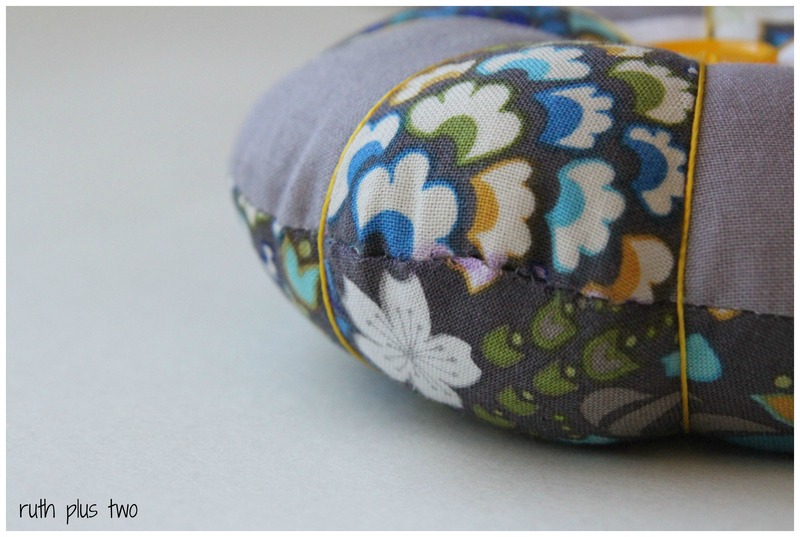 Anyway, the only tricky part of this little project was hand sewing the opening closed neatly. I unpicked and re-sewed the little sucker three times. I’m still not happy, but it’s liveable. I’m happy to say my points really did match in the centre, but even if they don’t you don’t have a problem – any indiscretion is covered up by the button. I hope you’ve all got a lovely weekend planned. We’re planning a slow one with a bit of playing in the garden and hopefully a trip, for me, to the Canberra Spinners and Weavers Open Day on Sunday. This entry was posted in quilting, sewing, stash. Bookmark the permalink. lovely pin cushion. having two pin cushions can help, though in my experience both end up in the same place or one just completely disappears. 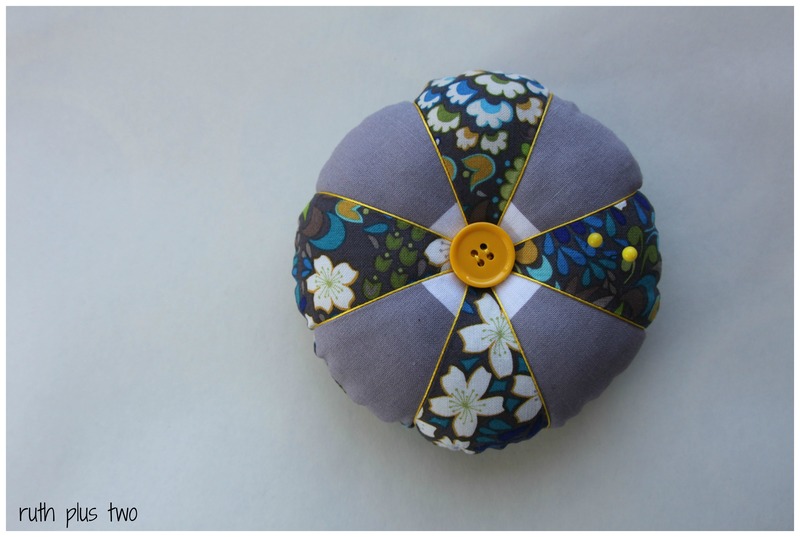 I saw a project recently where you have a pin cushion attached to your sewing machine, haven’t tried that one yet. No doubt that will happen here too….I’ll let you know! 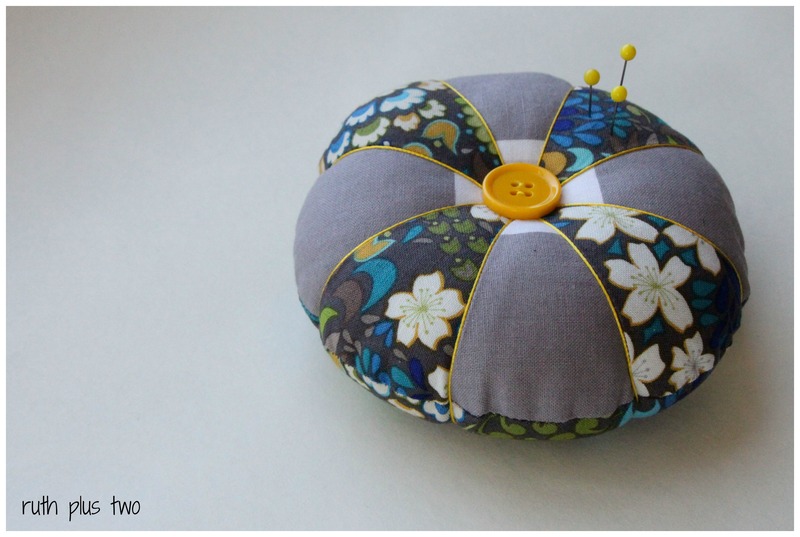 I’ve seen the sewing machine pin cushion idea too – it looks pretty intriguing. What a cute little scrap project! Thanks 🙂 I think I was prouder of the fact I didn’t buy anything to complete the project than the finished product!